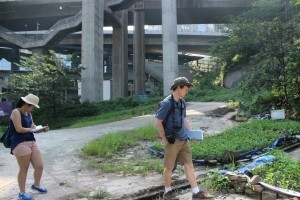 Five New Paltz students set out last fall to explore the viability of urban farming in Chongqing, China, under the mentorship of Geography Department Associate Professor Salvatore Engel-Di Mauro and Assistant Professor Melissa Yang Rock. To call their work a successful faculty-student collaboration would be an understatement. Along with their faculty mentors, Marian Chen, Melissa Iachetta, Aidan Mabey, Kevin McGill and Joanne Zhao developed a successful grant proposal, spent four weeks conducting international field research and gave a presentation at a scholarly conference in October. And though Chen, Iachetta and McGill have now graduated, the team continues to collaboratively analyze their research data with an eye towards the publication of a journal article and a presentation at a second conference this spring. The research team poses for a group photo in China. Pictured (l-r) are: Dr. Salvatore Engel-Di Mauro, Kevin McGill, Aidan Mabey, Melissa Iachetta, Joanne Zhao, Shirley Chen and Dr. Melissa Yang Rock. Rock, then in her first semester at New Paltz, heard about the ASIANetwork Student-Faculty Fellows Program grant last fall through the Asian Studies program, of which she is an affiliated faculty member. Seeing an opportunity to collaborate, she approached Engel-Di Mauro, who conducted a Fulbright project the previous year on contamination processes in Rome’s urban gardens. Engel-Di Mauro welcomed the idea to expand on his research by exploring the social processes at work in urban farming. The professors then recruited students with an interest in environmental issues for their team. Though the grant proposal would focus broadly on urban farming, the professors allowed the students to develop their own research focus. In researching urban farming in China, the students discovered an intriguing photo essay online of urban farmers in Chongqing. “We were able to see farms directly adjacent to high rise buildings. For me that was so unfamiliar, yet intriguing that I wanted to learn more,” said McGill ’15 (Geography). Upon learning that Chongqing was the fastest growing urban center on the planet, the students saw an opportunity to explore the role urban farming will play in feeding an increasingly urbanized population. The students had a month to conduct a literature review on urban farming, develop research questions and complete the grant application. They worked throughout Thanksgiving break all the way to the start of finals week. “There was no guaranteed payoff, but they were willing to throw themselves into the application process,” said Rock. The $39,500 grant paid for all expenses related to the trip to Chongqing, which lasted from July 1-28, including airfare, ground transportation, housing, vaccinations and visas. McGill, Chen, Zhao, Mabey and Iachetta use a local Chongqing map to identify pre-selected sites using ESRI satellite imagery. 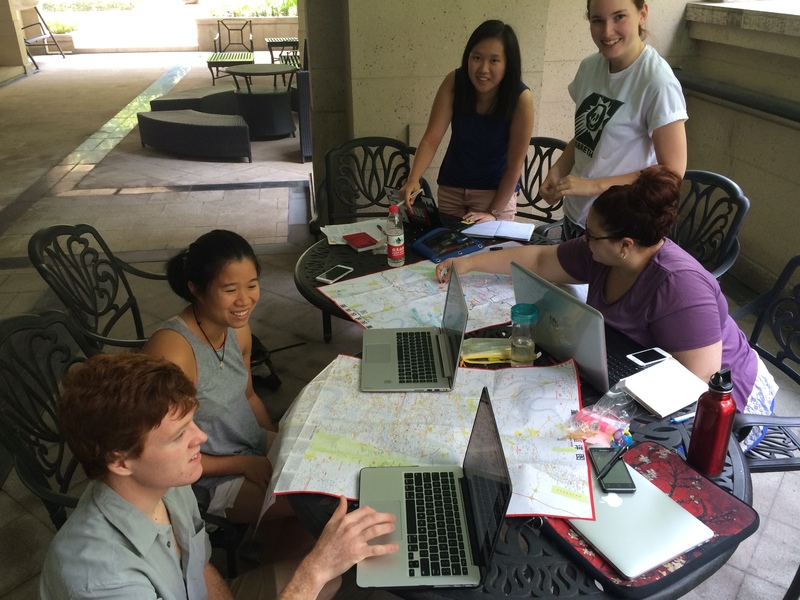 For the site selection process, the team began with a tourist map and labeled any sites that they discovered in their pre-fieldwork research, as well as any sites that they came across during their first few days in the city. They analyzed satellite imagery of areas within central Chongqing and selected areas with favorable farming conditions. They then went on excursions and recorded their observations of urban gardens, noting if the plots were well tended, what crops were being grown and the likelihood of interviewing farmers on the site. 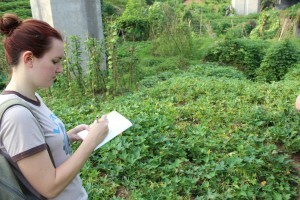 Mabey takes notes on crop types found in a local garden. Zhao and McGill observe a field site located next to a Chongqing subway station. 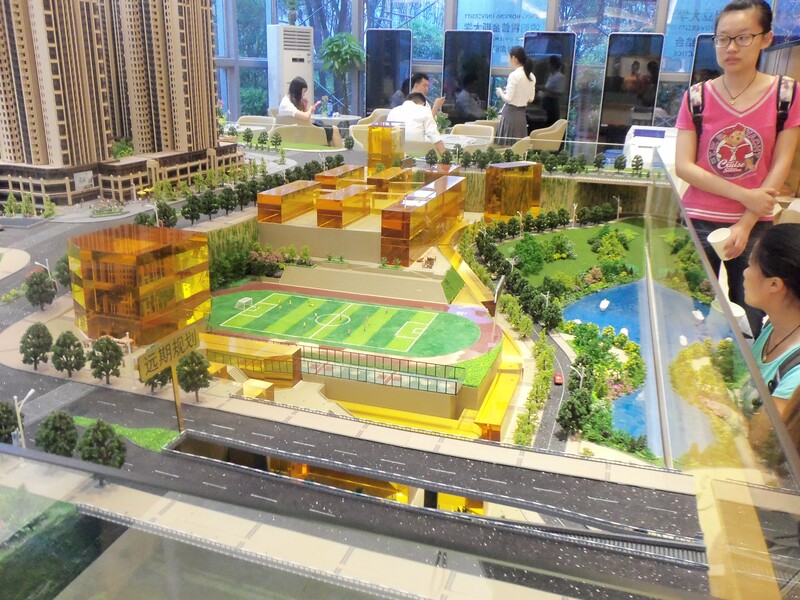 A scale model shows a proposed development inside Chongqing. Residents cultivate farms on plots of land designated for major construction projects. From their interviews with farmers, which they conducted with the aid of translators, the team learned that most were poor to lower-middle class residents nearing retirement age. Prior to the trip, the team assumed that most farmed for survival but discovered a multitude of motivations once in Chongqing. Some farmed as a hobby, others farmed for supplemental food, and others continued a lifelong practice after being displaced from their rural homes. 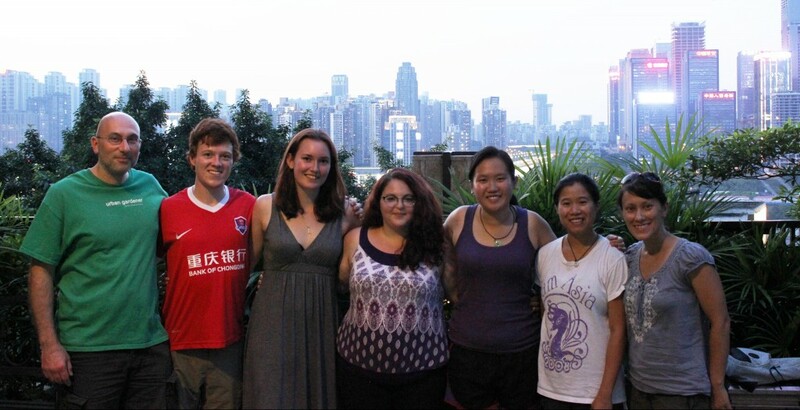 Zhao ’16 (Geography) reunited with the group in Chongqing after collaborating remotely during her spring study abroad semester in Guilin, China. 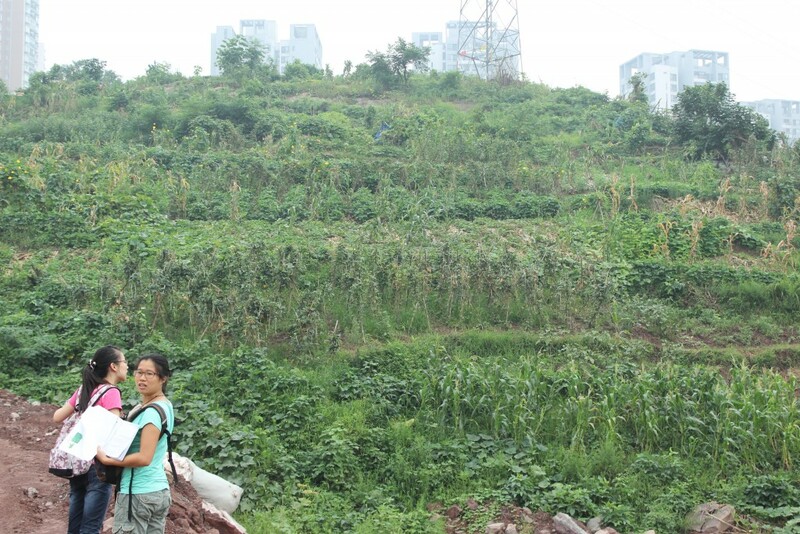 Zhao noted that unlike the politicized urban gardening/farming movement in the United States, “there is no overarching reason to why they are farming” in Chongqing. Engel-Di Mauro and Rock each supervised a group of students while conducting field research, and applauded the students’ collaborative spirit. Chen observes a local garden field site, accompanied by translator Daisy. Though the team is still in the process of analyzing their data, Zhao, Mabey, Rock and Engel-Di Mauro shared their initial findings at the New York Conference on Asian Studies, held October 17 at Vassar College in Poughkeepsie. Mabey, the youngest of the team members, gave the presentation, which she described as both intimidating and rewarding.